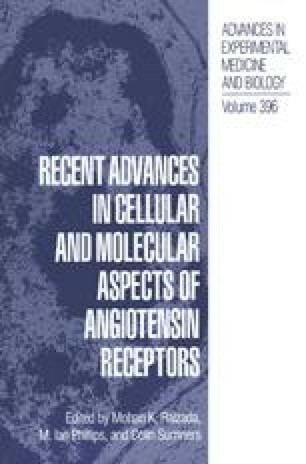 Angiotensin II (Ang II), the principal active component of the renin-angiotensin system (RAS), plays a major role in the physiology of the cardiovascular system by affecting diverse target tissues such as vascular smooth muscle (to stimulate vasoconstriction), myocardium (to increase heart rate and contractile force), adrenal cortex (to release aldosterone) and medulla (to release catecholamines), pituitary (to regulate release of Vasopressin and other hormones), kidney (to promote sodium reabsorption) and brain (to increase thirst and drinking, and to stimulate a centrally-mediated pressor response) (reviewed in 1–3). The peptide also promotes cardiac hypertrophy and contributes to the neointimal proliferation of vascular smooth muscle following arterial injury (4,5). The potential role of Ang II as a growth factor also implicates it in the pathogenesis of hypertension and atherosclerosis (6). In addition to these effects on the cardiovascular system, Ang II may also be active in non-cardiovascular tissues such as the ovary (7,8).